Balloon Race Winner from Neston Fair, held on 4th July. In a pretty mediocre summer, Neston Fair at Comrades Field was once again a lovely sunny day, thus the whole event was well supported, a fun and friendly family afternoon. 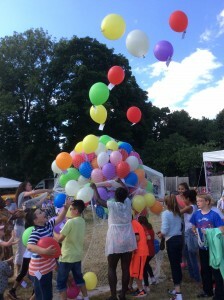 OAKS team of supporters had organised some pre-sales of balloons, however, brisk interest from the population of Neston with friends & family from the surrounding areas ensured we released 1,000 balloons. 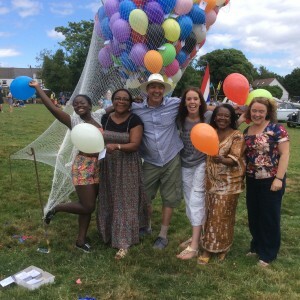 Samhilda, Fostina, Nic, Carrie, Margaret & Lyn in front of a rapidly filling net of helium balloons. Colourful balloons being released from Comrades Field Parade Ring. The Race was sponsored by the NEW ‘Neston Building Supplies Ltd’, they have just opened on the Clayhill Industrial Estate, off Liverpool Road, Neston. The prize of £100 voucher for Marks & Spencer plus a tub of organically grown vegetables was won by Sally from Charter Crescent, Ellesmere Port, she had the winning ticket No 0894. This year the north-easterly breeze took her balloon to Ponteland, Nothumberland. Sally was thrilled & excited, not just the voucher, she was particularly taken with the array of vegetables as she is a keen cook. Award ceremony. 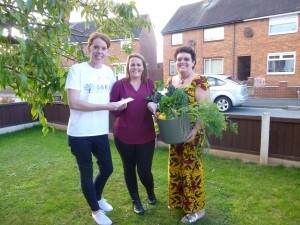 Carrie presenting M&S voucher to Sally along with Laurel & her tub of organic veggies. 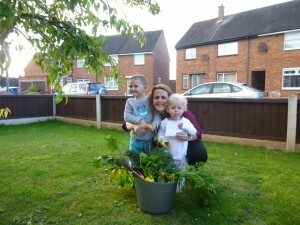 Sally with her children, no doubt in for a little treat from Marks & Sparks as well as some yummy food. OAKS raised £1040 for our school in Bo, Sierra Leone. Although the country has not yet been declared Ebola free (new cases are becoming extremely rare), all schools returned to work in April after an 8 month shut down. Everyone is delighted to be back, children love school. We are continuing to expand and develop. 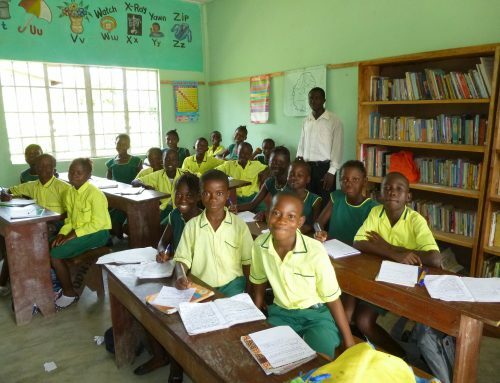 January 2016 will see our 3rd class in Junior Secondary School, equivalent to Year 9. There are high expectations to continue to build on our success by hopefully creating a Senior Secondary School facility. Thank you to everyone who has supported us this year with our fundraising Balloon Race. Please keep following our progress at OAKS school. With your help we are making such a difference to the lives of an increasing number of kids and their families. Presently 334 pupils, in Bo, Sierra Leone.